Posted March 29, 2014, 8:59 p.m.
Another month, another jam! Crashdown was a Titanfall de-make intended for Mini Ludum Dare #50 (theme: de-make), but was delayed due to plague. I got sick just before the jam was scheduled to officially start, so I couldn't finish the thing. It sucked watching the art and sound assets just sit in a Dropbox folder while the deadline passed. Oh, well. The project was surprisingly challenging despite being a simple one-stage run and gun. The toughest parts were figuring out how to make the various types of wall jumping work reliably and figuring out what to do when the mech dies. You might recognize the cool-down icon was taken from Molten Progeny, though I had to tweak it somewhat. 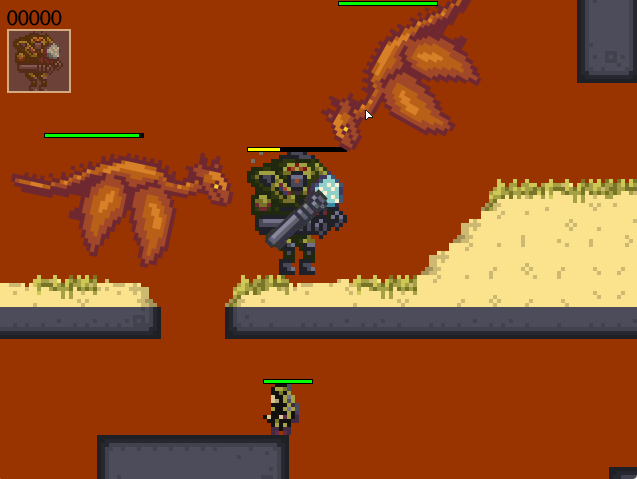 I was never able to guarantee that the dragons you fight wouldn't get stuck in the level geometry - which crashes the game - but I was able to make it happen infrequently enough to be playable. I'm happy with the logic I made for the jumping behavior, but all the mech interactions are so messy that I'd rather re-write them if I were to do something similar in a future project. It sounds like I'll be jamming again in 2 weeks. The projects will be Unity-based it looks like, so I'd better get back into it. The Crashdown project page is here.